Will its resolution and pedigree translate into top scans? Excellent reflective scans, but the Epson 4990 is faster. Only film fans could justify the price. The flagship of the Canon scanner range takes on Epson's Perfection 4990 head to head. The CanoScan 9950F includes a Super Toric lens to counter the aberrations introduced by conventional, spherical, scanner lenses, and the platen can accept up to 30 35mm images at once. FARE Level 3 dust reduction takes care of blemishes, and it features backlight compensation for lightening darker areas in contrasty originals. This technology should improve the 9950's flatbed performance, too. Any scanner designed to resolve the detail in film should have no trouble with reflective originals. Canon has included buttons on the front for copying, scanning, PDFs and email, to make this model a real all-rounder and not just a photographic tool. The scanning software is both clear and simple to use. Most users will opt for the Advanced mode, where you can set the resolution and auto tone/unsharp mask/ descreen options in moments. 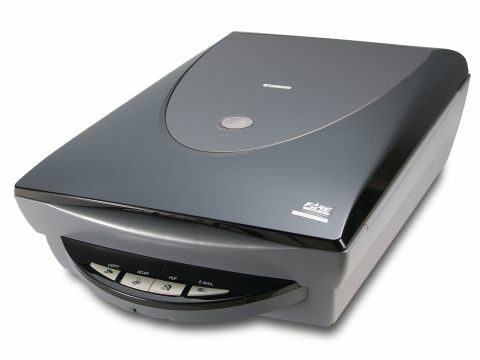 Not surprisingly, this was a fast scanner in our tests, though the margins aren't as great as we hoped. Scan results are excellent, though, with strong colours and contrast. The descreening option appears to work well, but it's apparent by now that the level of sharpness in our test image (or any other printed page) is well below what any of these scanners can record. Interestingly, the 9950F produced a superb 150dpi monochrome scan with no interference effects in photos - presumably the pixel pitch of its sensor was far finer than the halftone dots on the page. The 6x4 photo scan was first rate.